Ozone generator performance metrics are commonly referred to in concentration (either % by weight or g/m3) or ozone output (g/hr or lb/day). These measurements are both important to quantifying the ozone production of an ozone generator. But what do they mean, and which is more important? Link to ozone generation performance metrics HERE. Every ozone application is different. And based on your application the concentration or overall output of ozone production is more or less relevant. The ozone output value is shown in a mass over time value that indicates mass of ozone produced in a given period of time. As flow rate of feed-gas through the ozone generator increases, however, the concentration of ozone decreases. This is a trade-off that exists across the entire flow-range of ozone feed-gas through most ozone generators. Ozone concentration is the ratio of total feed-gas to ozone production. As flow rate of feed-gas through an ozone generator decreases, ozone concentration increases. As flow increases less of the oxygen in the feed-gas is converted into ozone as the contact time for the feed-gas in the ozone generator decreases, there is less time to produce ozone out of the given volume of gas. When ozone is used to be dissolved into water ozone solubility becomes important. Solubility is the ratio of ozone gas that will dissolve into water based on physical conditions. As ozone concentration increases the solubility of ozone into water increases. Therefore, ozone output in g/hr becomes less relevant when dissolving ozone into water. Higher ozone dosages into water will require higher ozone concentration to achieve solubility into water. Overall ozone production is necessary to achieve desired ozone dosage rate, however if ozone concentration at that production rate is very low, ozone gas will never dissolve into the water and be lost. 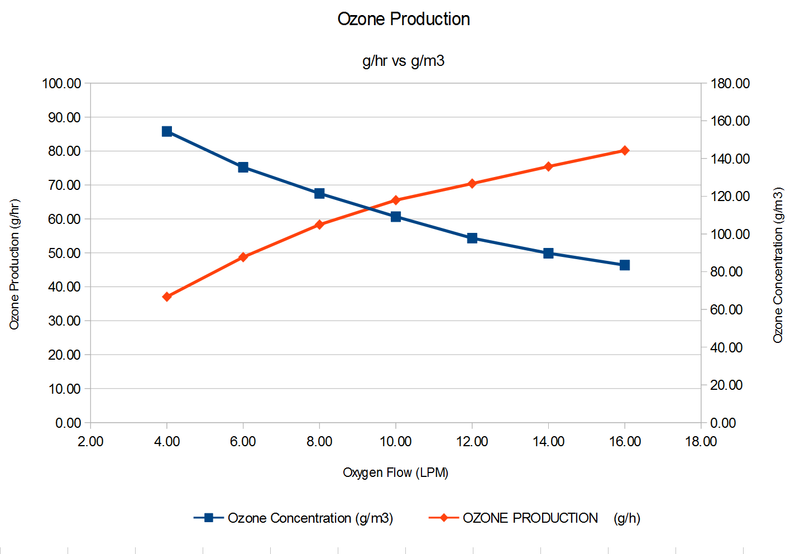 There is a balance to ozone concentration vs ozone output when using ozone for water treatment. A simple rule of thumb, if you have the choice to use an ozone generation system that provides the same ozone output in g/hr but at a higher ozone concentration, choose the higher ozone concentration every time. There are ozone applications where ozone is used in air treatment only. Odor removal, food storage, etc. In these applications ozone concentration is much less important. Ozone output in g/hr is the only factor that is relevant in most of these applications. More ozone mass will provide more ozone dosage into the air. Consider oxygen or air consumption along with power consumption in these applications. Ozone used for in-situ groundwater remediation is normally diluted with air, to increase the radius of influence of the ozone gas in the water table. Due to this dilution ozone concentration is not a major factor in this application. Ozone output is the only major factor considered in this application. Ozone is used for cooling tower treatment as a biocide in the cooling tower. In these applications, very low ozone dosage rates are used in the water. Therefore ozone concentration is not as important in many of these applications as ozone solubility is not as critical.